“It’s not a kink. It’s a mark of respect.” Wow I love that line. It really struck home for me. 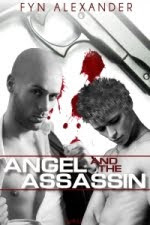 I enjoyed both of the Angel and the Assassin books. To me, whether the Top is called Sir, Master, Daddy, or Your Highness... the label doesn't much matter. But for some people, the Daddy label is a huge squick factor. I would never be comfortable using the label, but it doesn't bother me when others do. And the way it was written in the book didn't bother me. For these two characters, it worked.